Today, I am featuring Diana, a crafter who re-purposes and up-cycles clothing. Although she uses the name Heart Felt Creations by Diana, you can find her purses in her daughter’s etsy shop. I hope to have a giveaway of her daughter’s cloth bags later this year. Just in time for Earth Day, here is Diana’s story. 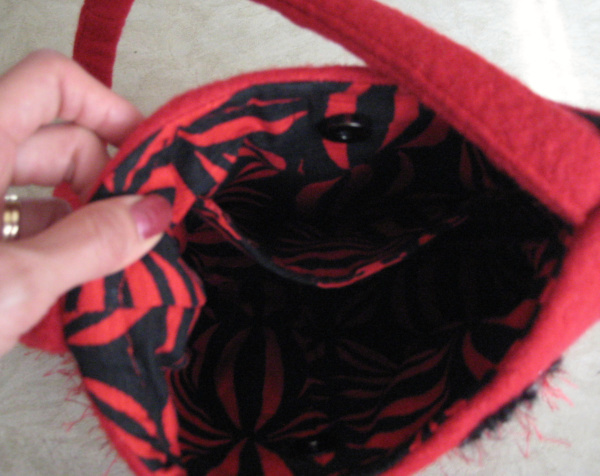 I have been making the felted purses for about 2 years. A friend of mine got me started. She had purchased a number of magazines that had pictures of different felted purses and designs. I really liked what I saw and decided I wanted to try to make some as gifts for family and friends. I work in our church’s clothing closet and find the wool sweaters there. I then take them home and shrink them and have a number of different vintage patterns that I use as patterns of styles from the 1920’s, 1930’s, 1940’s and 1950’s. I also have a needle felting machine I use to felt yarns into the wool fabric to create designs as well as to add scrap fabrics. The scrap fabrics come from our clothes closet, local retails stores, and garage sales to decorate the purses with flowers that I cut from scrapbooking dies. I have purchased wool roving from a number of different suppliers and add buttons, beads, ribbons, whatever I can find that will add interest. No two purses ever come out the same and are each unique. How inspirational! Diana takes unwanted things and puts some love into them, ending up with a purse for someone to love. 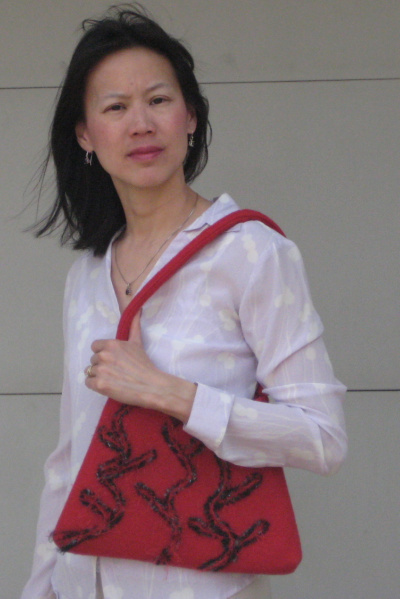 I am reviewing a red purse. Doesn’t it look nice? Looks. This purse looks cute and different enough to be individual, yet mainstream enough to not scream “Hey! I’m handmade!” The lining is very fun.The strap hangs from my shoulder at the right length for me. The purse itself has pleasing and expected dimensions. The embellishments add texture and interest. I’m not sure of the timeless quality of the embellishments. However, if viewed as a seasonal item, I think the issue matters little when priced at $30. Note how the purse hangs from the shoulder. Function. Purses are for holding things, and this purse can hold a lot. It has a generous pocket in the lining that I would use for a cell phone or keys. The felt is a lightweight, flexible, and very sturdy fabric. This baby can hold a lot of stuff, no matter how much your stuff weighs. Everyone uses purses with her own unique habits, so take the two drawbacks that I see with a grain of salt. 1) This purse cannot “stand up.” It has to lay down or hang. I like to set my purse down on the counter while paying for my things at the register when I’m shopping. Maybe this is not an issue for some of you. 2) Felt collects (and shows) “stuff.” By stuff, I mean fuzz, dust, hair, cookie crumbs, glitter, etc. So if I were to lay this purse down on an upholstered chair in a house with furry pets, or at the table in the coffee shop, I’d be breaking out the lint roller once I got home. Construction. I like the felted wool a lot. The needle felting secures the embellishments very well. The stitching seems secure. The magnetic snap is expected as the industry standard closure. The snap allows the embellishments to show well. I think the felted wool would take a LOT of wear without showing it. Pricing. Because of the long-lasting characteristics of felted wool, I feel the pricing is very appropriate. A purse from Diana would be something you could use for a long time. Overall. Diana’s upcycled purses get a thumbs up. You could win one $30 purse, or get half off a higher priced purse. In order to enter the giveaway, I need two things from you. If I get just one, your entry will not be valid. Please enter only once. Continental U. S. only. 1. Take this survey to enter the giveaway. 2. Leave a comment here stating which purse in diymama’s etsy shop you hope to win. The survey will be open on Monday, April 11, 2011, and will close on Monday, April 18, 2011 at 11 PM CDT. Winner will be chosen with Random.org. Purse photos courtesy of diymama. Headshot courtesy of Diana. Red purse photos by Julia. This entry was posted in crafting and tagged giveaway, upcycle. Bookmark the permalink. I honestly cannot decide between the Blue felted purse and the Burgundy; they are equally my “favorite”…I came upon this giveaway through someone else’s blog and am so glad to find it. I love reading about crafts even though I personally am all thumbs. Took the survey…hoping to win. And I am not mean nor an ugly ogre. The grey sweater purse is my favorite, but they are all lovely. I completed the survey. Thank you for the opportunity to try one of these purses. 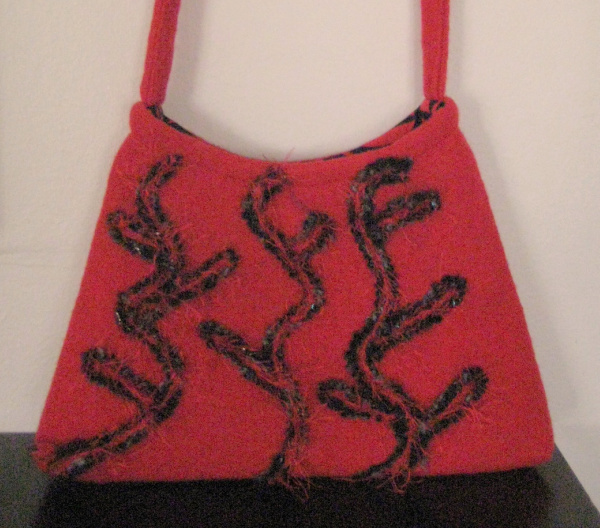 Christina – xristya@rock.com – I’d like to win the Burgundy Swirls Felted Purse! All the purses are just lovely, and so intimate and friendly! I like the Orange Felted Wool Purse with Flap. took the survey and love the green felted purse! thanks for hosting this! The purses are beautiful. Would love to win the gray one. They are all wonderful. I liked the Orange with the butterflies the best. Did the survey and I hope to win the blue one! Diana does a great job with the purses! I really like the gray sweater purse. Hi: Good giveaway. Took the survey and the purse I like is Grey Felt Purse With Purple Flowers. So cute. Keep up the good work. It’s a hard pick, but I think I’d pick the gray sweater purse. Thanks for the great giveaway! I just had a blowout in my recycled silk purse and could really use the replacement. I too am hoping to win the Blue Felted Wool Purse found at http://www.etsy.com/listing/71547620/new-blue-felted-wool-purse-ready-to-ship. I especially love the swirls on it! Thanks for the great giveaway! P.S. I also took your survey ! My favorite is the gray felt with purple flowers!! My next favorite is the orange butterfly! I took the survey 🙂 Thanks!! I took the survey and I would like the gray felted purse with purple flowers. Too cute! I really would love to win the Felt Turquoise Purse With Floral Print, it’s beautiful! I like the gray sweater purse. Very cute. I like the Grey Sweater Purse! I took the survey! New to your blog! Thanks for the fab giveaway!! I really love the Yellow and Black Felted Wool Purse. They are all beautiful, but the yellow and black really grab my attention. Thanks for the opportunity! I like the Gray Sweater purse and I took the survey. This is my first time visiting your blog. I’m a homeschooling mom too. Looking forward to checking out your posts. Thanks! i took the survey and i like the Burgundy Swirls Felted Purse, but i also really like the Yellow Recycled Ambercrombie Sweater Purse ! I love the Black Floral! I took the survey Thanks!! 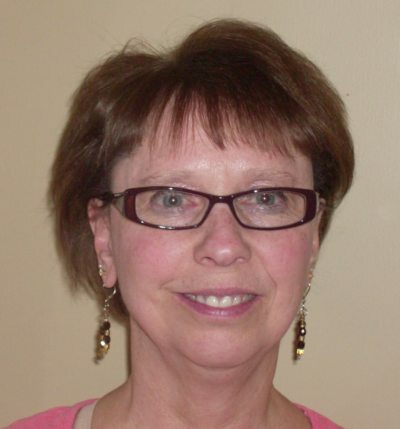 Barb K.